We are delighted to be part of the inaugural AJ Architecture Awards, with our Nucleus project having been shortlisted in the Public Building category. The AJ are committed to visiting each of the shortlisted schemes, and in addition to stand-out design, they will consider each project in detail – such as how it has met or exceeded the brief, how it has promoted client or community engagement, and how it has excelled in the use of space or sense of place. The winners will be announced at the end of the year at a Gala dinner in London. 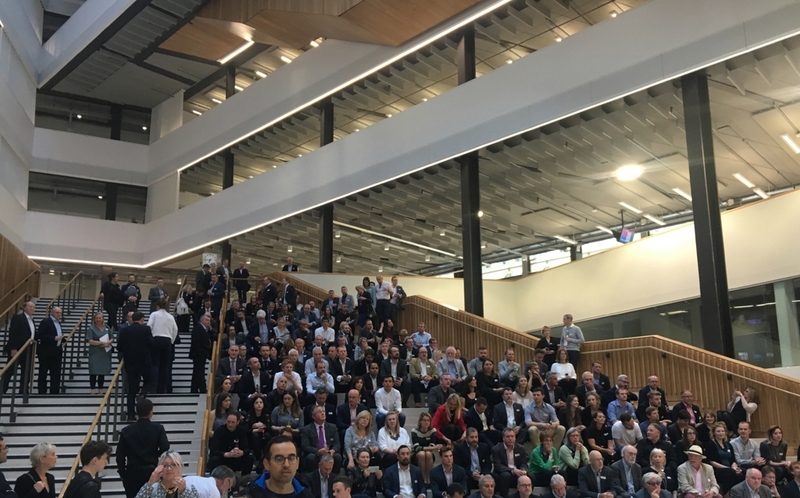 Staff, clients and colleagues came together at our City of Glasgow College, City Campus, to celebrate the completion of the final part of the supercampus project for City of Glasgow College. The City Campus building, the second phase of the development, opened in August 2016, with the Riverside Campus completed in 2015. The City Campus provides a wide range of facilities offering superb opportunities to students, and the 2016/2017 year are the first to enjoy the fantastic facilities which include: over 500 learning spaces, industry-standard TV and Radio studios, a fully equipped aircraft training cabin, 16 professional cookery kitchens, creative design and photography studios, sportscotland standard sports complex, industrial-sized construction, craft and built environment space, Scholars fine dining restaurant, a city market - butchers, bakers, fishmongers – a commercial hair salon, beauty salon and nail bar, and a Business Centre. 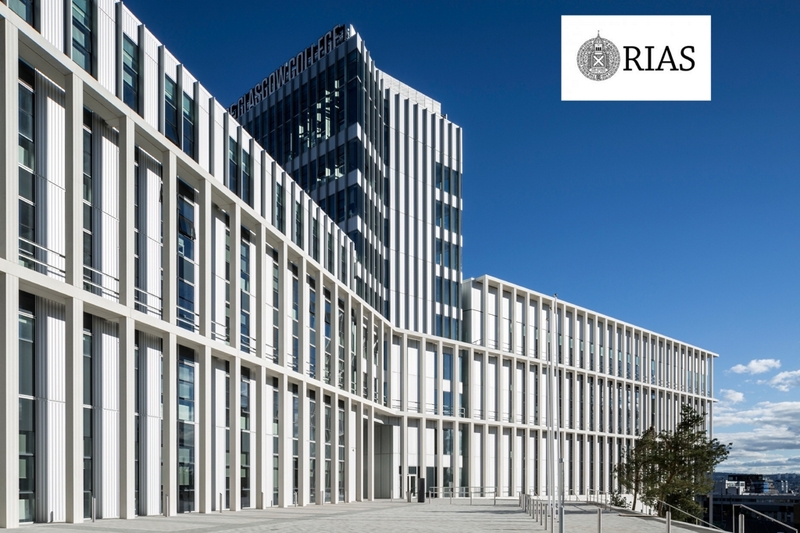 The City Campus is currently shortlisted for the RIAS Andrew Doolan Best Building in Scotland, a British Construction Industry Award and the RIBA Stirling Prize – all to be announced later this year. Our Nucleus building – The Nuclear Decommissioning Authority and Caithness Archive – has been shortlisted for a Scottish Award for Quality in Planning (SAQP). The SAQP are one of the Scottish Government’s most prestigious awards and are aimed at acknowledging achievements in planning – ranging from strategic visions to new settlements. The aim is to recognise the hard work being carried out by, and within, the planning profession. 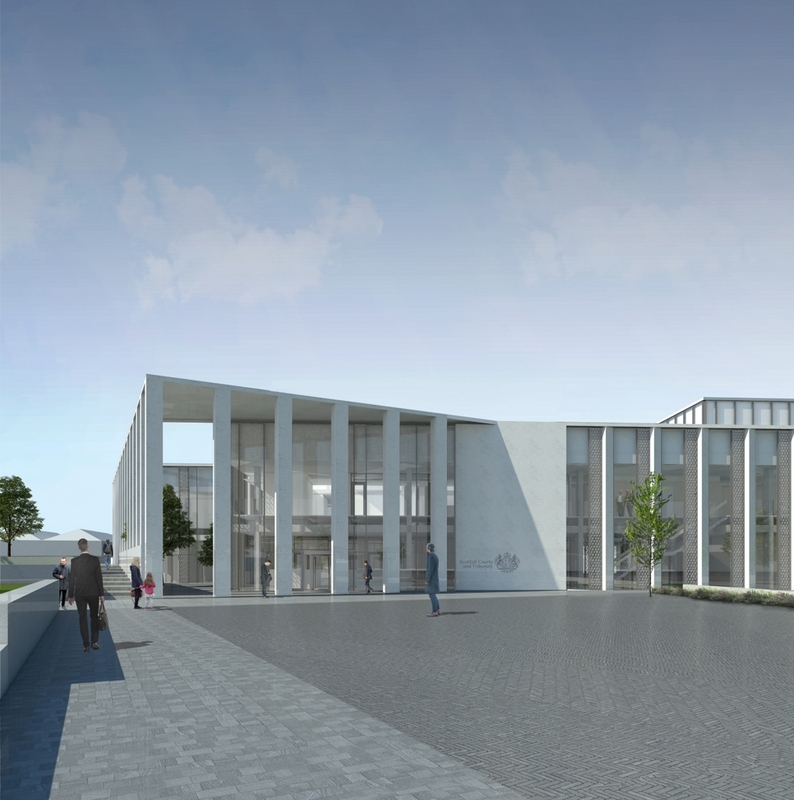 Reiach and Hall Architects have been working alongside The Scottish Courts and Tribunals Service (SCTS) and Robertson Construction to prepare revised plans for the new Inverness Justice Centre. Construction is planned to begin in late 2017 with contractor Robertson Construction Ltd to complete the main building works in 2019. 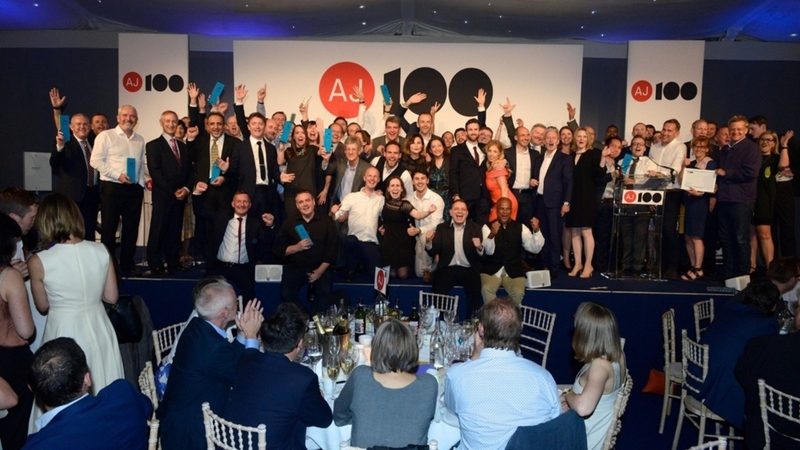 City of Glasgow College, City Campus was awarded the AJ100 Building of the Year last night at the annual AJ100 dinner. This coveted prize recognises the finest building completed by an AJ100-listed practice in 2016. "Very few large-scale schemes of any sort achieve great quality at every scale. Reiach and Hall and Michael Laird’s building is masterful in both its macro-configurations of plan and elevations and in its finer details." "A beautifully considered project. The completed building is alive, filled with natural light and easy to navigate. The materials are well-chosen and the detailing is pared. Every component has been handled with great skill and flair." "This is a large scheme that manages to bring daylight and energy into its interior, cleverly using the changes in level. The external staircases, courtyards and atrium all provide plenty of places for social interaction. The elevations are beautifully detailed." We are delighted to be awarded this prize and to hold our place on the AJ100 list - we fully enjoyed our collaborations with City of Glasgow College, Sir Robert McAlpine, Michael Laird Architects, Graven, Arup, Hulley & Kirkwood, FES, rankinfraser landscape architects and Studio LR. 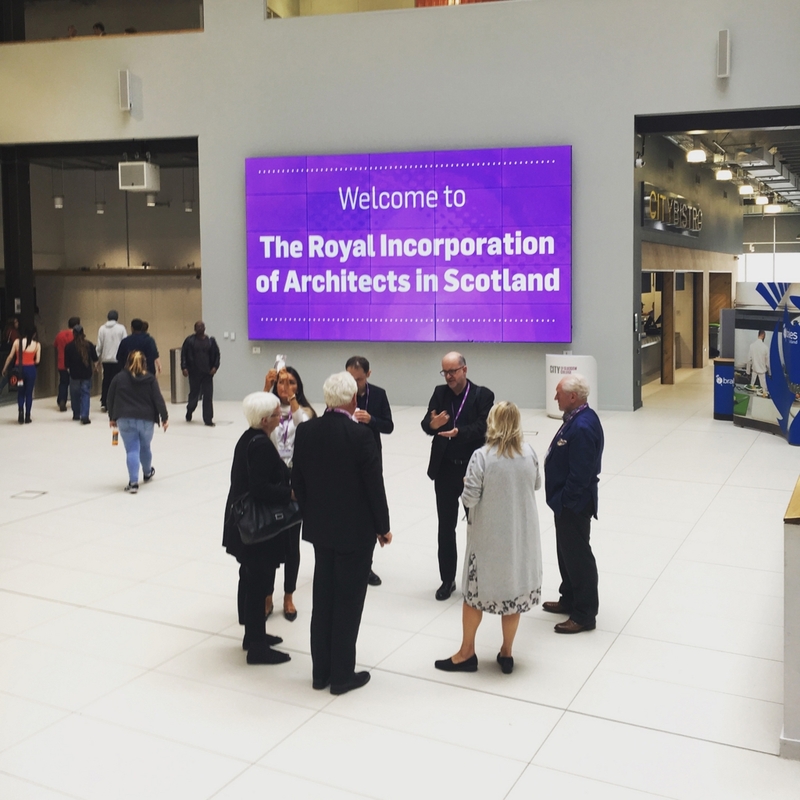 Reiach and Hall were thrilled to collect an RIAS Award for our City of Glasgow College City Campus at this year’s Royal Incorporation of Architects in Scotland (RIAS) Awards ceremony. The RIAS announced 12 Regional award winners representing the very best of Scottish Architecture. "The initial impression is of immensity, boldly signalling the building's presence as an important place of learning. The palette and form of the building are deliberately restrained to generate something of skill, clarity and elegance, on the grandest scale." 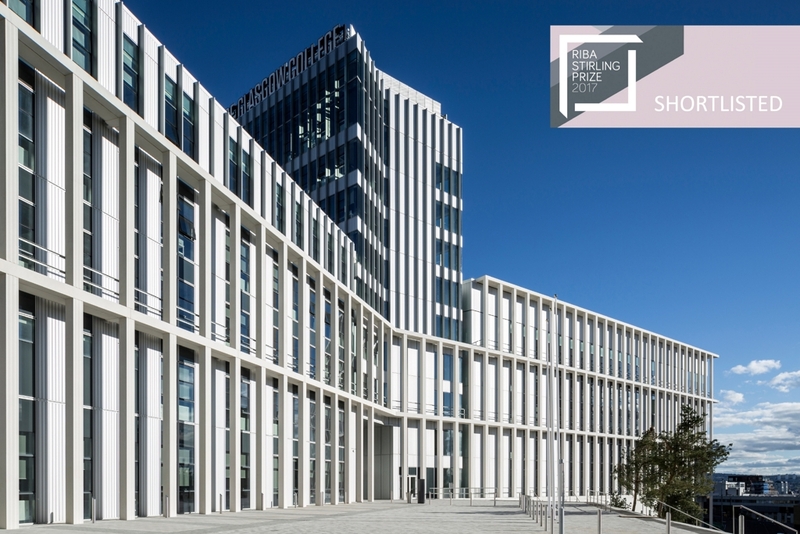 City Campus will now move forward to be considered for the RIAS Andrew Doolan Best Building in Scotland Award. 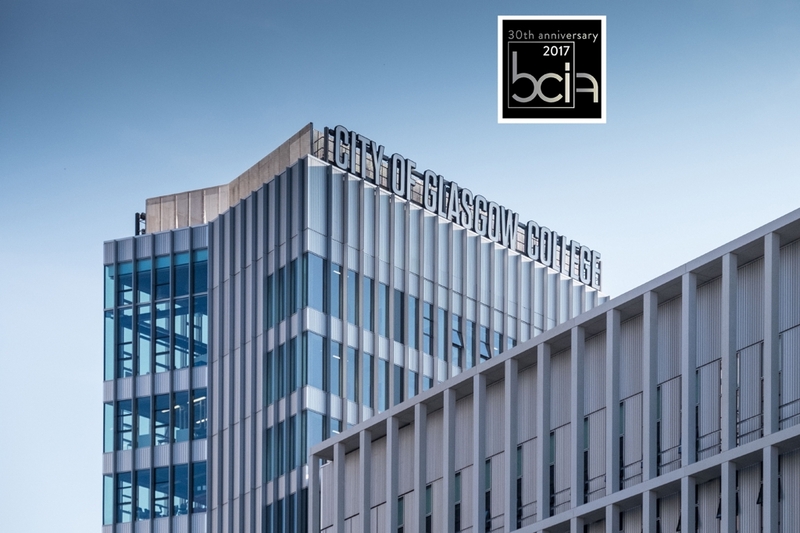 The City of Glasgow College’s City Campus has been shortlisted for the 2017 British Construction Industry Awards, in the Major Building Project of the Year [over £50m] category. The City Campus, by Reiach and Hall Architects and Michael Laird Architects, represents an amazing team effort from all disciplines and we are delighted to move forward to stage 2 of the judging process. The winners will be announced on 11 October 2017. 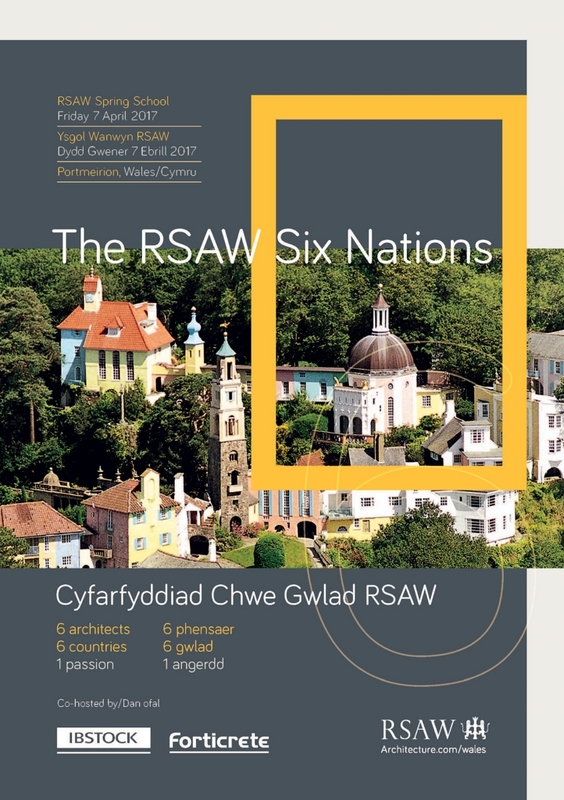 The Royal Society of Architects in Wales (RSAW) is hosting a line-up for its own Six Nations ‘unmissable match’ in the form of the RSAW Spring School at Portmeirion on Friday 7th April. 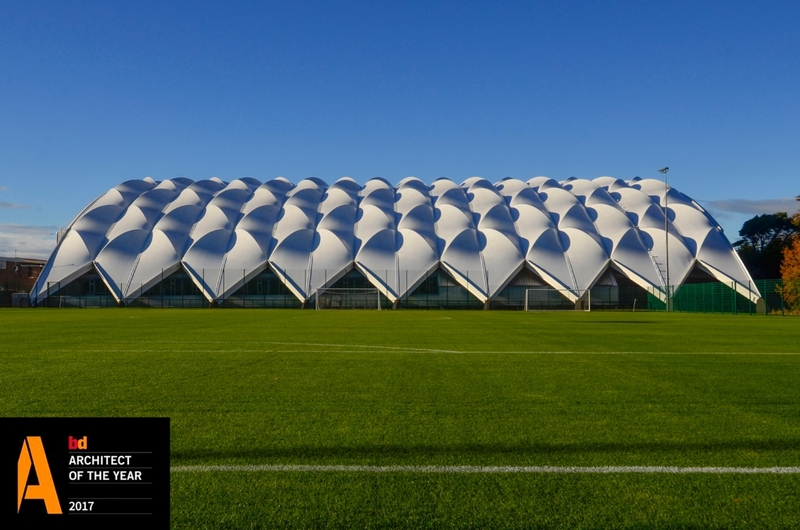 The conference draws architects from six rugby-loving nations for a day-long exploration of thoughtful and responsible design. In a series of condensed ‘Inspiration Hours’, RSAW presents an interpretation of the multi-faceted impact of architecture – from a compassionate response to the refugee crisis in Europe to thoughtful civic design and imaginative new homes in sensitive settings. Neil Gillespie will be representing Scotland, alongside for England: Jessica Reynolds, vPPR Architects, London; France: Christian Pottgiesser, Christian Pottgiesser Architectures Possibles, Paris; Ireland: Grainne Hasssett, Hassett Ducatez Architects, Dublin and SAUL School of Architecture University of Limerick; Italy: Enrico Vianello, TAM Associati, Venice; and Wales: Chris Loyn, Loyn & Co, Penarth, Cardiff. 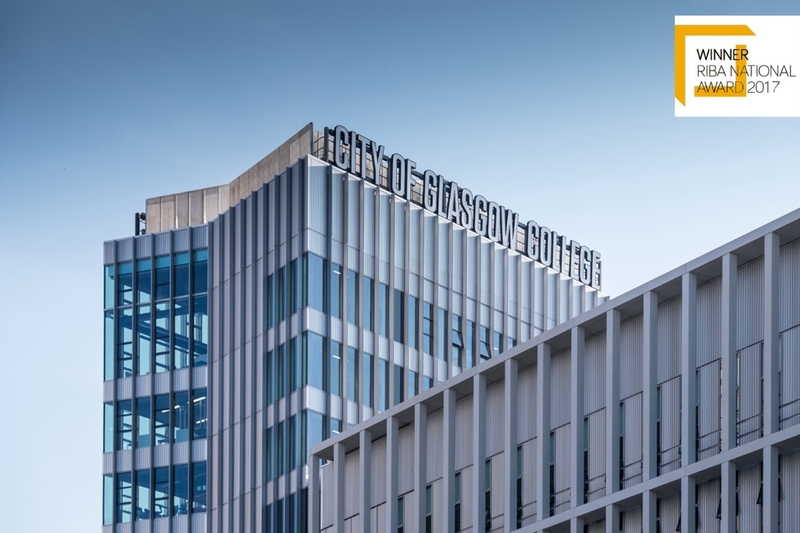 Our City of Glasgow College, City Campus, has been shortlisted in the 2017 Construction News Awards as ‘Sustainable Project of the Year’. The City of Glasgow College’s two new city centre campuses will cater for 40,000 students and 1,200 staff over the 70,000sqm development in which City Campus offers departments of Construction & Built Environment, Art & Design, Creative Industries, Community, Care & Social Sciences, Business & Enterprise, Computing, Food, Hospitality & Tourism, Sport, Hair & Beauty, Languages & ESOL & Library Services. Planning permission has been approved for the development framework at the University of St Andrews, Eden Campus, Guardbridge. 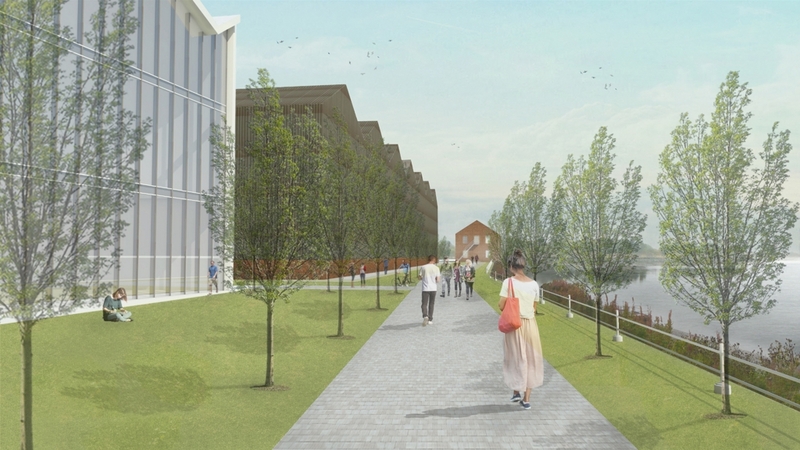 The proposals, prepared by Reiach and Hall Architects in 2016, represent a £24million development plan on the former paper mill site at Guardbridge to include an Advance Materials Centre (incorporating circular bio-economy, biorefinery and carbon reduction); a sandpit (a zero carbon integrated energy community to support industry and academia to create new ideas for innovation in a ‘sandpit’ environment); Eden Enterprise Centre (to provide capacity and support for innovators, start-ups and SMEs); and a location for a “living lab” environment (to maximise knowledge transfer and learning to the community). Reiach and Hall are delighted to receive the 2017 award for Education Architect of the Year (Higher Education) at the BD Architect of the Year Awards. The award, presented for a portfolio of work, was given to Reiach and Hall for a series of buildings that, according to the judging panel, "show both creativity and flexibility". This is the second time we have received this title, having won previously in 2012. We are delighted that the judges have recognised our 50-strong range of projects which demonstrate the practice's growing education sector portfolio. 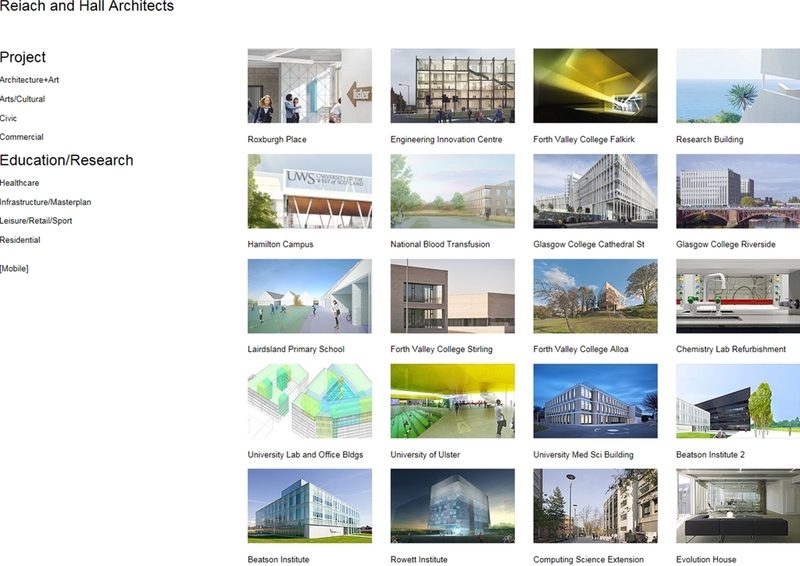 The entry included completed, current and future education projects, highlighting our work at Heriot Watt University with Oriam, completed in the last year. 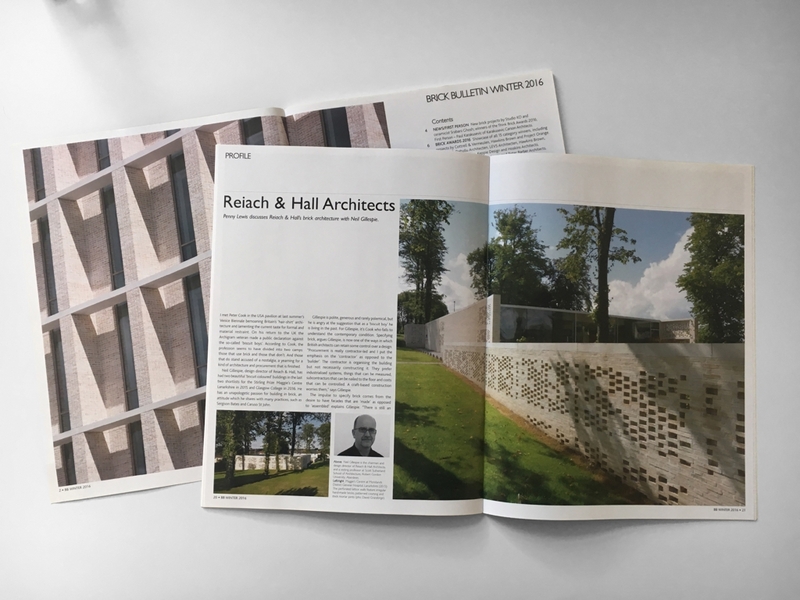 Reiach and Hall have featured in the very last printed edition of the ‘Brick Bulletin’ – a publication that we have admired for years. The profile, entitled ‘The Art of Making’, captured an interview between Penny Lewis and Neil Gillespie, our design director. It looked primarily at the brick architecture of the practice in recent years but also recognised that for R&H this is not a passing fad, but more part of our tradition, with examples dating from the beginning of the practice in 1965 to the present day. "specifying in brick is now one of the ways in which British architects can retain some control over the design… contractors prefer industrialised systems… and the impulse to specify brick comes from the desire to have facades that are ‘made’ as opposed to ‘assembled’." The Brick Bulletin continues as a digital edition. 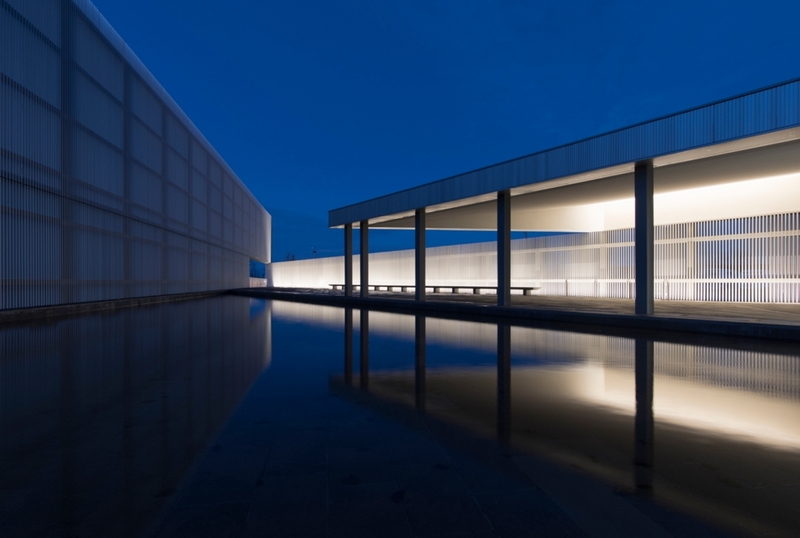 Reiach and Hall have been ranked second in the Urban Realm Top 100 Architects list. Reiach and Hall have recently completed a fit-out for the new Bloomberg offices at Edinburgh Quay. Bloomberg is the global business, financial information and news leader. With headquarters in New York they currently employ 15,000 people in 192 locations around the world. 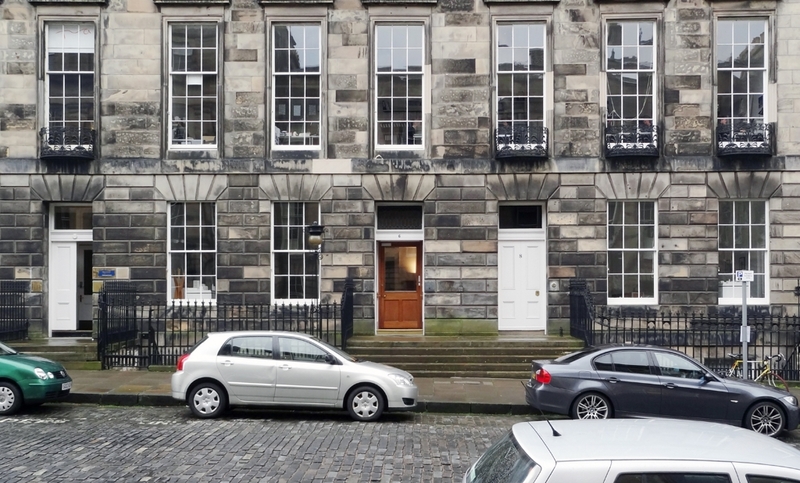 This project relocates the current Edinburgh News Bureau from its existing location to a new site to allow for business expansion. The fit-out provides open plan office area, including work spaces, meeting spaces, support spaces and comms room. The office space is fitted out to CAT A standard. The base build toilets were also refurbished. Reiach and Hall would like to congratulate our clients sportscotland and City of Glasgow College who are both shortlisted in The Herald and GenAnalytics national Diversity Awards – in the category Design for Diversity. The Diversity Awards recognise the outstanding success of companies, organisations, individuals, third sector organisations and community groups who are demonstrating a strong commitment and track record of achievement in ensuring that everyone in our society has the opportunity to fulfil their ambition, aspirations and potential. The Design for Diversity Award will be presented to an organisation or company which has delivered a project in Scotland that captures and can provide evidence of an inclusive design process including accessible design and assistive technology to enable the broadest range of users. We were delighted to welcome the RIAS Andrew Doolan Best Building in Scotland judges to the City of Glasgow, City Campus – designed in a joint venture between Reiach and Hall Architects and MLA. The building received an RIAS Award in June 2017 which allowed it to progress as a finalist for the Andrew Doolan Best Building in Scotland Award. Alongside 11 other winning projects, the City Campus will compete for the coveted title, with the winner being announced in November 2017. Reiach and Hall Architects are thrilled to be shortlisted for the third year in a row for the Stirling Prize and would like to recognise and celebrate the close collaboration between the combined architects’ team of Reiach and Hall Architects and Michael Laird Architects alongside interior designers Graven Images, landscape architects rankinfraser, principal engineers Arup and Hulley and Kirkwood, the contracting team of Sir Robert McAlpine and FES and, most importantly, our client the City of Glasgow College. 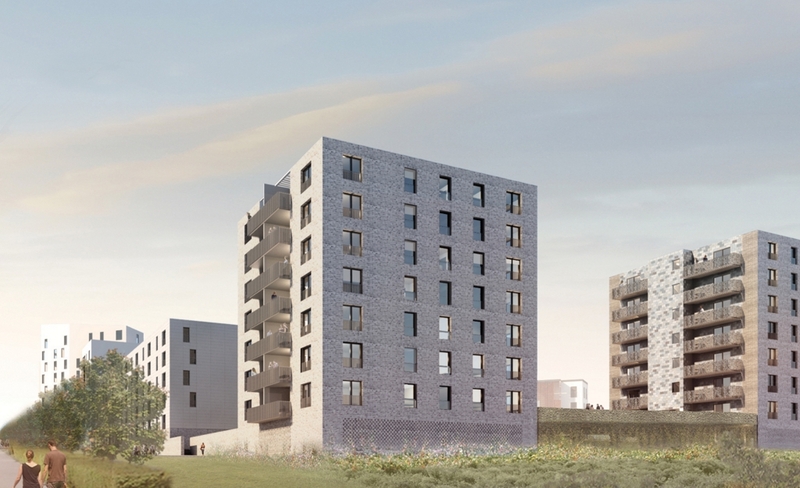 The latest phase of development at Granton Waterfront by Places for People has been submitted for planning to City of Edinburgh Council - this new proposal for 89 new homes is in the third phase of a wider residential community of around 450 homes. Reiach and Hall Architects are pleased to continue to be involved in the waterfront masterplan, having completed phase one in 2007 - the award winning ‘Upper Strand’ development. Our proposals for Phase 3 take advantage of extensive views to the Forth and Edinburgh City Centre and will create a new courtyard, landscaped to provide amenity space and a high quality living environment for the residents. This communal green space is at the centre of the proposals and connects the existing development on Saltire Street with the proposed development. In addition, each of the apartments are dual aspect and are designed for good, natural daylighting with large full-height openable windows and/or balconies. All apartments meet or exceed the Council’s Design Guide advice on minimum internal floor areas. We are delighted that our nomination of City of Glasgow College for Client of the Year was successful. 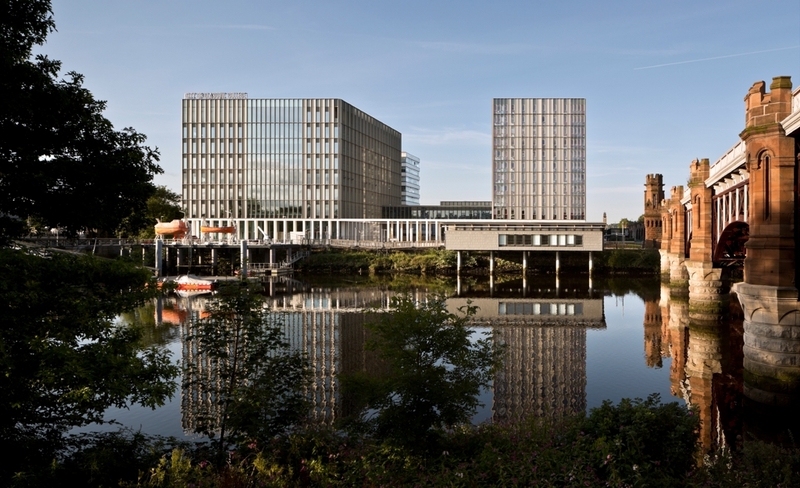 We have been working with the College alongside Michael Laird Architects, to deliver two highly complex buildings: the 2016 Stirling Prize-shortlisted Riverside Campus and the just-completed City Campus providing new facilities for 40,000 students and 1,200 staff. 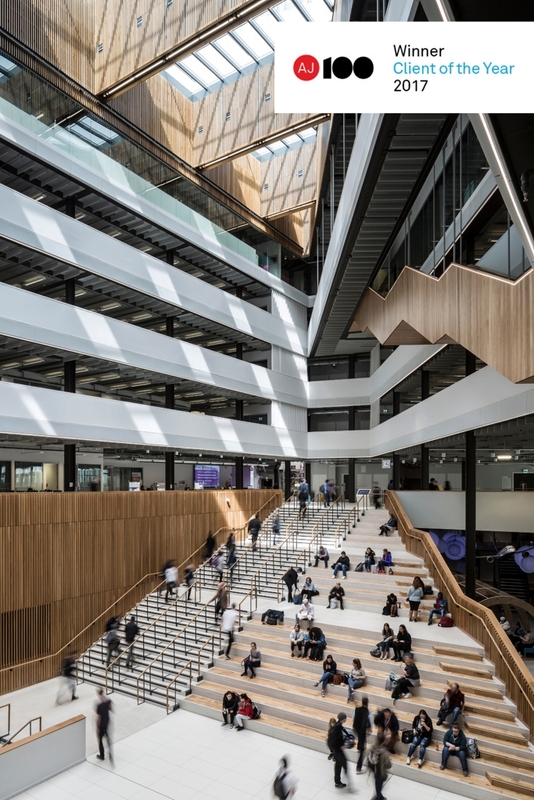 As client for one of the largest higher education developments in Europe, the college College has shown total commitment at every step of the design and construction process. Tenacity and attention to quality and detail have marked out the College’s approach, and these were essential attributes, given the project’s history of false starts, change of procurement route and the economic background of global recession. We nominated the College because they clearly understand that architecture isn’t just about accommodating functions in line with the brief, but can itself be a tool to transform teaching away from ‘chalk and talk’ towards integrated group working and cross-disciplinary learning. Their wholehearted engagement in the project’s delivery will pay dividends and benefit generations of students to come over the two buildings’ life-cycles. Reiach and Hall had a great night at the Scottish Design Awards 2017 where we collected a total of four awards. City of Glasgow College, City Campus collected the award for Education Building of the Year 2017. 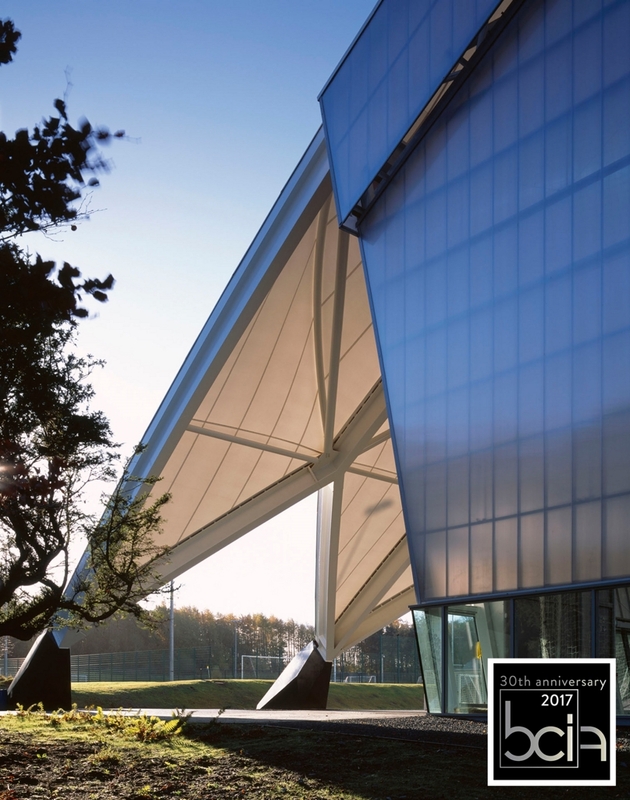 Our Oriam project for sportscotland, Heriot Watt University and The City of Edinburgh Council, picked up the award for Leisure/Culture Building of the Year 2017. Oriam also received the Architecture Grand Prix 2017. 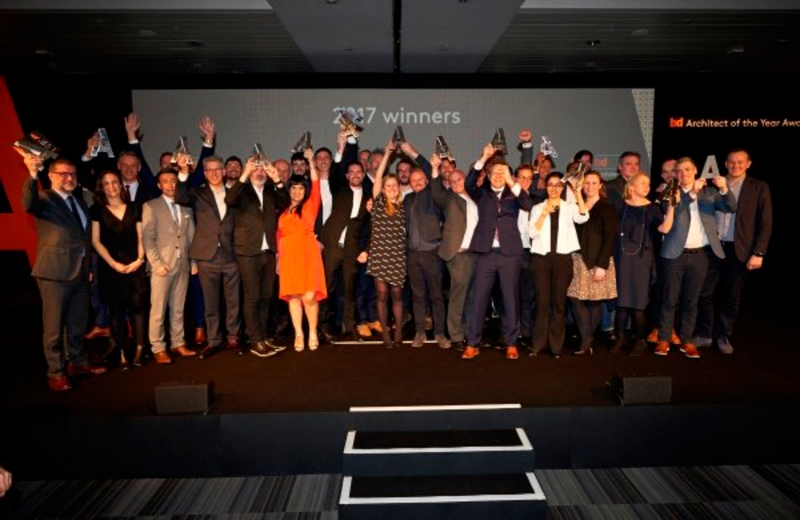 Reiach and Hall collected the award for Architectural Practice of the Year 2017. This is the fourth time that we have received this accolade, and it is especially pleasing that this is recognition from our peers. Reiach and Hall have been shortlisted with Tony Brooks Architects of Barbados for a new 127 bed Referral Hospital in Kingstown, St Vincent and the Grenadines. The project is to replace the existing Milton Cato Memorial Hospital and, should we be successful, would be Reiach and Hall’s third commission in the Caribbean in recent years. 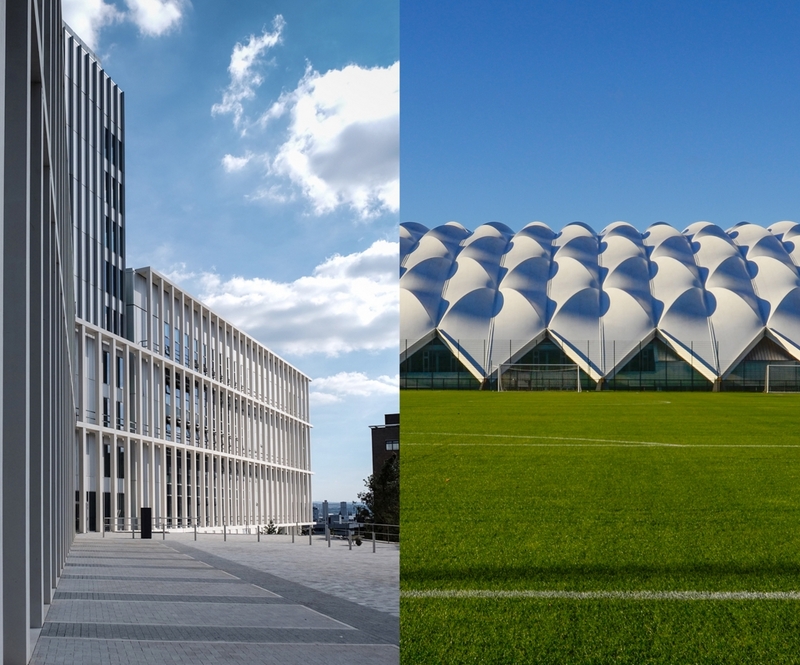 Reiach and Hall Architects have two projects shortlisted in this year’s RIAS Awards process – The City of Glasgow College, City Campus and the Oriam building for Heriot Watt University, City of Edinburgh Council and sportscotland. These two projects are amongst 27 shortlisted for the 2017 awards. The judging panel touring the selected buildings includes Karen Anderson FRAIS, Lorraine Landels Hon FRIAS, Stuart McKnight RIBAm MUMA and Ole Wiig FRIAS. Our City of Glasgow College, Riverside Campus, has been recognised in the 2017 Civic Trust Awards. The project, completed with MLA, has had a great awards history and this Civic Trust Award brings the total to nine architectural awards. Alongside this we were shortlisted for the RIBA Stirling Prize 2016 and the RIAS Andrew Doolan Best Building in Scotland Award 2016 – and we were are thrilled that our work has received such recognition. We are delighted that our Oriam building – for Heriot Watt University, The City of Edinburgh Council and sportscotland – has been highly commended at the 4th annual Scottish Property Awards. The project, designed as Scotland’s Sports Performance Centre, has received a recent burst of publicity as the 2017 Scotland Rugby squad have been using the facility as their training base during this year’s six nations tournament. 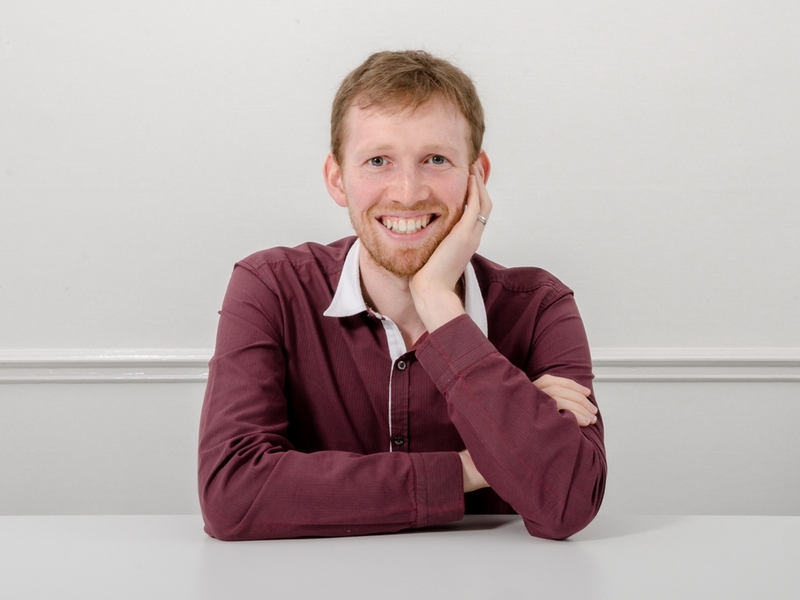 Reiach and Hall are pleased to announce that we have a new architect – Stephen McCullough has passed his part 3 exam. Congratulations Stephen. Reiach and Hall have submitted planning to reactivate Murchison House, which is currently unoccupied and sits within the University of Edinburgh’s Kings Buildings Campus Estate. 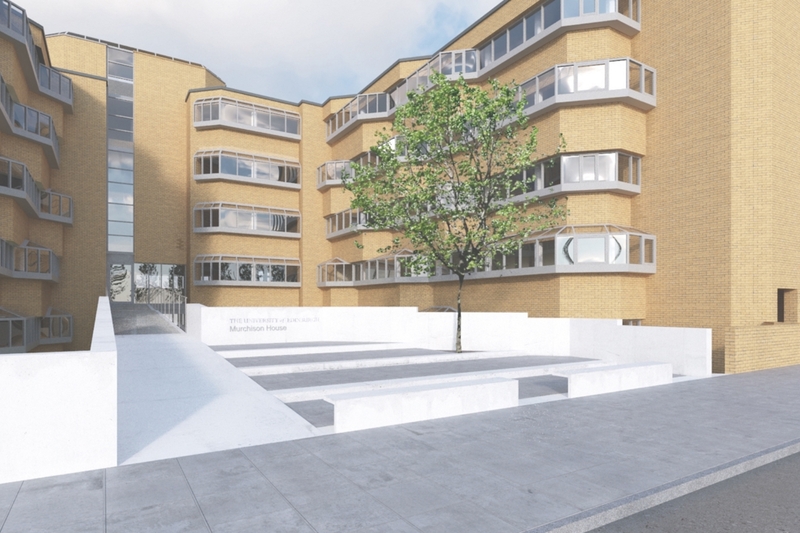 The proposal does not substantially alter the external fabric of the grade B listed 1970s structure, however, it does attempt to rationalise the existing floor space and seeks to provide high quality office and teaching accommodation. The proposals also aim to enhance and modernise the building for the latest standards; contribute to the streetscape and open space on campus; encourage the use of cycling by providing cycle parking and associated changing facilities for new occupants; and provide upgraded office and teaching accommodation within easy reach of public transport hubs and campus amenities. Oriam has ‘kicked off’ the awards year with a shortlisting for the 2017 Scottish Property Awards. The building is being presented in the Architectural Excellence category – focusing on public buildings completed in the last 12 months. This is the 4th annual Scottish Property Awards – an independent programme which celebrates excellence in commercial property across the commercial and public sector in Scotland. Reiach and Hall have won the Architectural Excellence Award for the last two years running – with our Maggie’s Cancer Caring Centre, Lanarkshire, and the City of Glasgow Riverside Campus (with Michael Laird Architects). Following this success, both projects went on to compete in the RIBA Stirling Prize in 2015 and 2016 consecutively. Reiach and Hall’s New Stobhill Hospital has featured in a Greek book on Hospital Architecture. 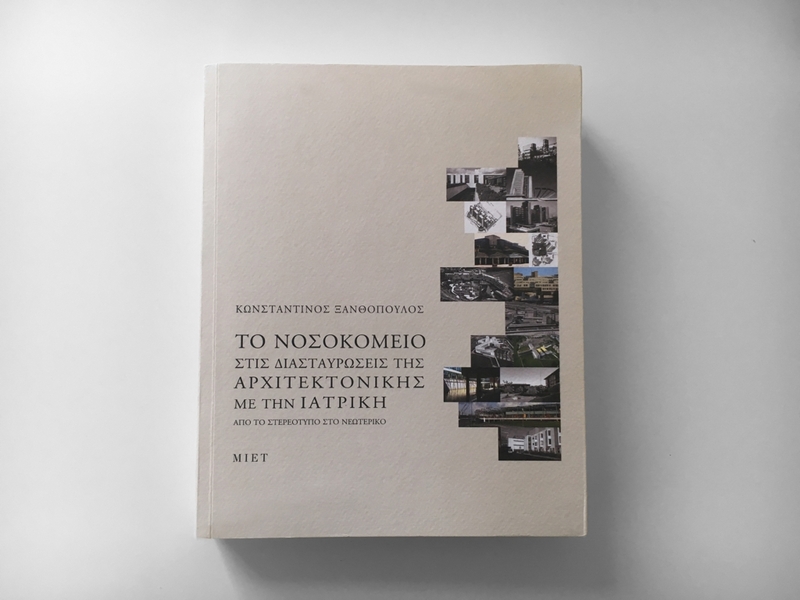 The book summarises the evolutionary path of the ‘modern hospital’ and seeks to open a chapter on the importance of architecture – the author K. Xanthopoulous, also touches on the notion that the hospital development was meant not only to improve patients’ environment but also contribute to improving the conditions of everyday life and society. Our New Stobhill Hospital was completed in 2009 – representing the first hospital of its kind to open in Scotland. Procured under PPP, the brief was for a true ACAD (ambulatory care and diagnostic) facility, with the ethos that the patient comes first! New Stobhill Hospital contains over 20 departments accommodating general day surgery, ENT, gynaecology, urology, renal dialysis as well as outpatient clinics, diagnostic services and therapy care. The design was carefully developed to provide a supportive framework throughout the patient journey. Reiach and Hall are delighted to be selected for one of the British Construction Industry’s special awards for 2017. A new category for this year, 'Social Infrastructure Project of the Year', aims to recognise projects that are improving society through socially better infrastructure. Oriam has been selected following a judge’s visit to the building which looked for teams that can demonstrate an understanding of the broader outcome their project can have in society. The category also looks at engagement with stakeholders that drive the project forward and measures the outcome, such that future projects can be improved. 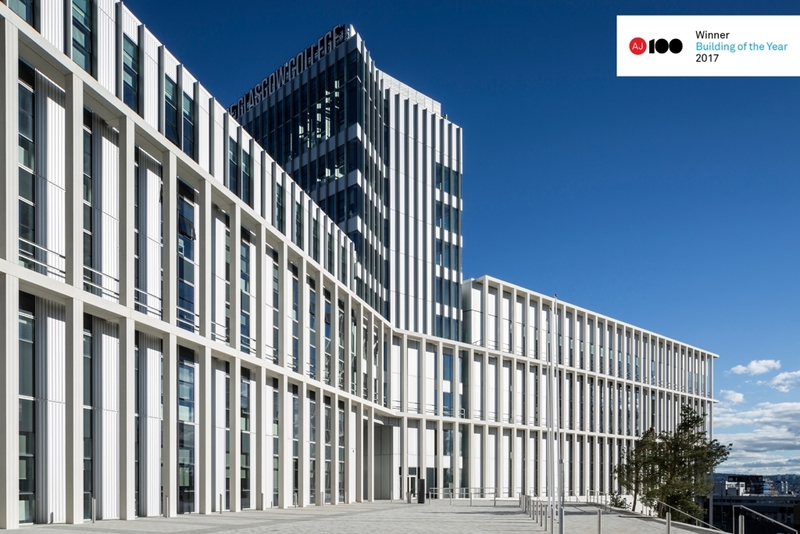 Oriam is also shortlisted for the British Construction Industry Award for Building of the Year (£10-£50M). Winners will be announced later in the year. First Minister Nicola Sturgeon joined Paralympians, Commonwealth Games athletes and local schools to celebrate the official opening of our building for sportscotland – the Inverclyde National Sports Training Centre in Largs. “This facility is stunning. The building is stunning to look at, what is inside is amazing and it's in a beautiful setting. 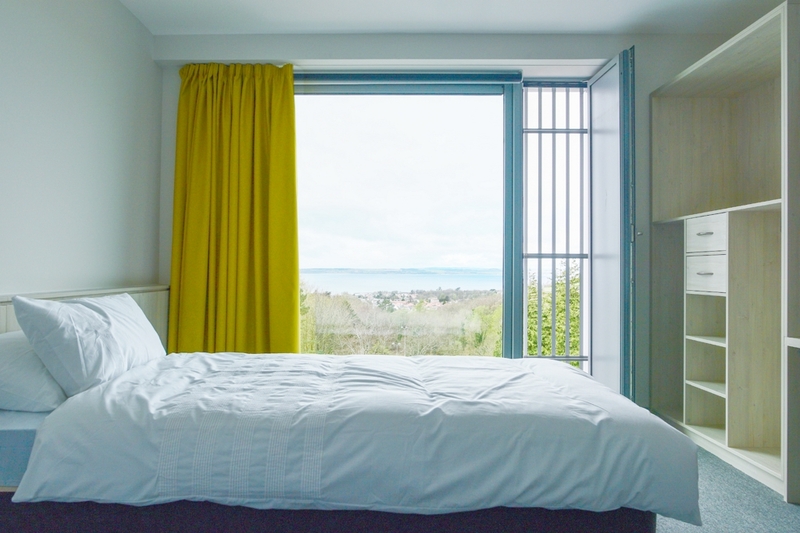 "The bedrooms are fully inclusive residential spaces for athletes to use and they have - I say this as an Ayrshire person - probably the best view in the whole country. "It is no exaggeration to say that this facility, and particularly the completely inclusive nature of the facility, makes it unique - perhaps not just in Scotland but anywhere in the world. "That's a fantastic accolade and one that everybody involved can be proud of." 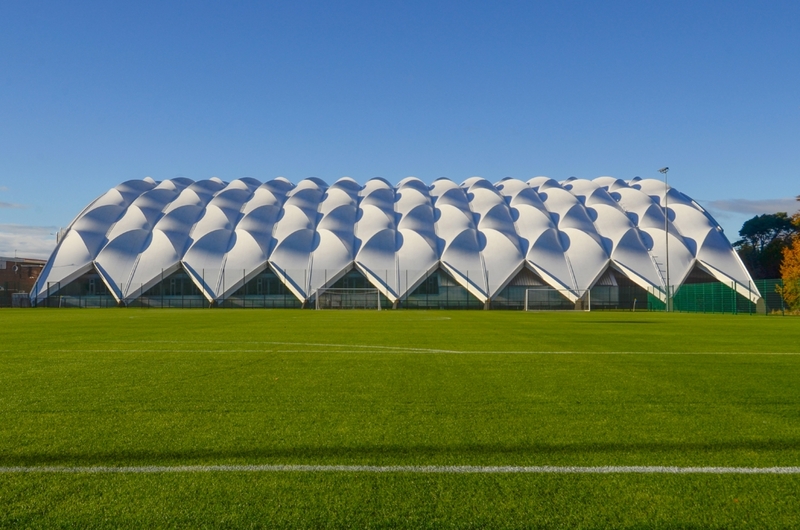 “Sports facilities are the best they have ever been in Scotland with a network of quality facilities the length and breadth of the country, including Aberdeen Sports Village and the national performance centre (Oriam) in Edinburgh (both by Reiach and Hall Architects). 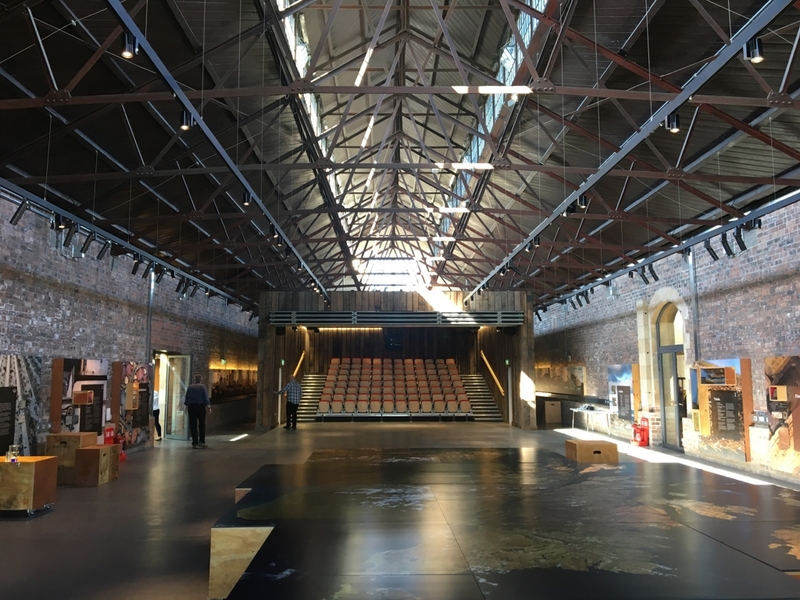 Historic Environment Scotland have revealed their new national building conservation hub – combining research and visitor attractions – with an official opening by culture and tourism secretary Fiona Hyslop. Reiach and Hall Architects are delighted to have worked alongside HES on this development in a consultancy role and are pleased with the pioneering new centre – set up to ensure knowledge, skills and materials are available to look after the country’s 450,000 traditional buildings which make up our important cultural heritage. The newly revamped building is now home to HES’s building conservation research and education facility, as well as offering augmented reality experiences and interactive exhibits – the project involved a complete renovation of the existing building with new build extensions on either side. Reiach and Hall are delighted to have been awarded an RIBA National Award 2017 for City of Glasgow College City Campus. RIBA National Awards are the most rigorously judged awards for architectural excellence in the UK. A building that wins an RIBA National Award sets the standard for great architecture across the country. As a national awards winner the project will now be part of the longlist for the RIBA Stirling Prize, which will be announced in October. Reiach and Hall Architects are ranked number 96 – the AJ have previously noted that we are ‘the keystone of the Scottish architectural scene’. Our Oriam Building – Scotland’s Sports Performance Centre – has been shortlisted for the 2017 British Construction Industry Awards, in the Building Project of the Year [£10m to £50m] category. 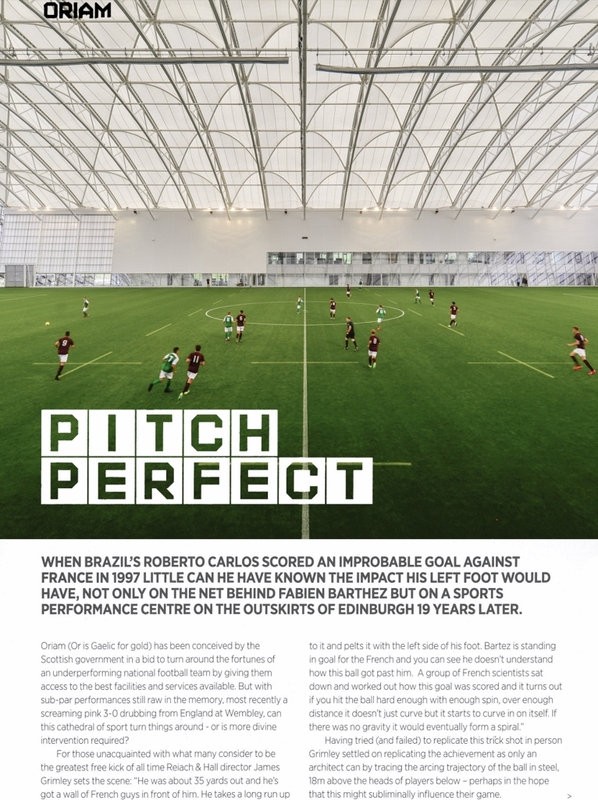 We are delighted that the project has made the shortlist and would like to thank sportscotland, Heriot Watt University and the City of Edinburgh Council for the opportunity to be involved in this magnificent project. We look forward to the awards evening on 11 October 2017. Our National Sports Training Centre in Largs for sportscotland is set to re-open as a residential sports training centre for schools, elite clubs, athletes and the local community. The building is designed as a fully-inclusive training and events venue for para-sports and is the first of its kind in the UK. "It's wonderful to see it ready to open and to hear how sportscotland are going to maximise the use of the centre for all. 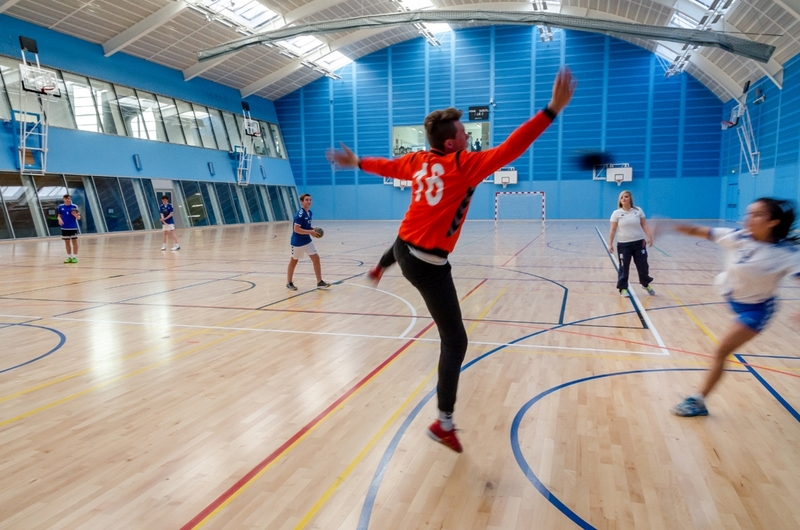 "Facilities like Inverclyde, and the recently opened Oriam, are not just for elite athletes. They have been designed to ensure that communities can benefit too." "While generations of Scotland's best athletes have trained here over the years, at Inverclyde we believe that everyone should have the opportunity to participate and progress in sport." 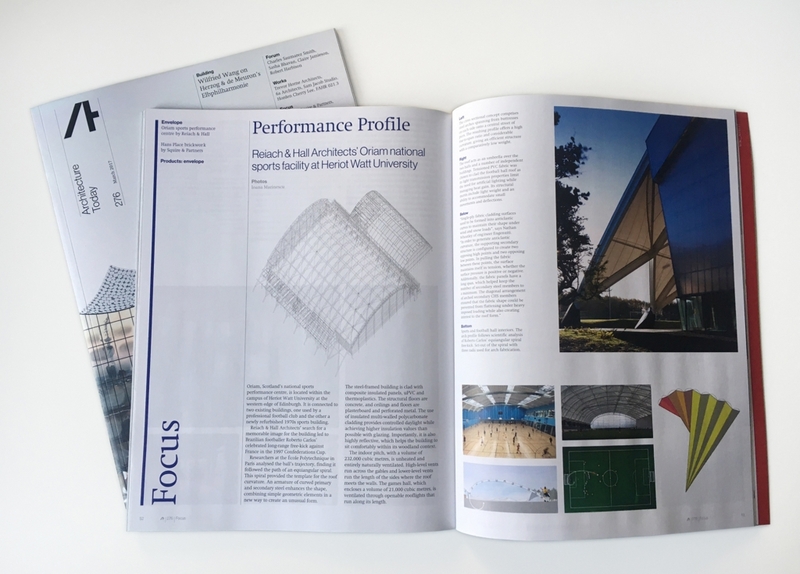 Our Oriam building has featured in the March edition of Architecture Today, focusing on the detail design of the new football hall, its structure and cladding. The feature study highlighted the detail at the base of the piers to the football hall and included some of our detail drawings and concept models. These sculptural bases were inspired by Alberto Giacometti’s sculpted heads and were fabricated in steel plate to support the differential trusts from the arches, providing longitudinal restraint against wind loads. 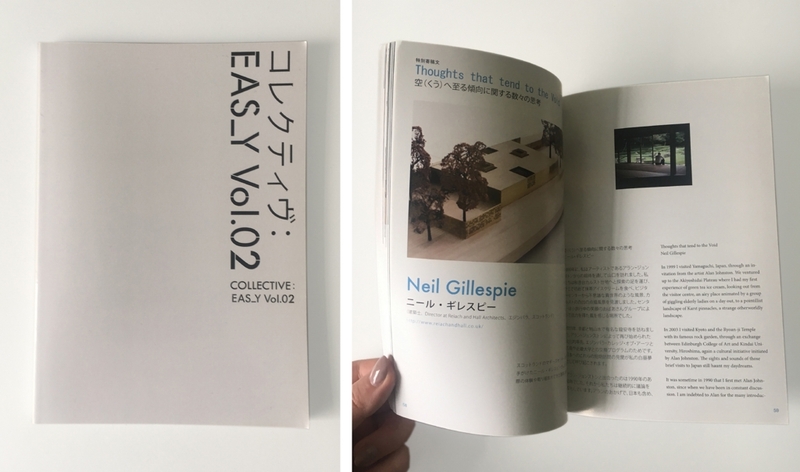 Neil Gillespie, has featured in a recent Japanese publication titled “COLLECTIVE: EAS_Y Vol.02”. The publication was organised as part of the ‘support program for emerging artists for the next generation’s cultural creations by the Agency for Cultural Affairs, Government of Japan’ – which offers the foundation and opportunities for emerging artists, as well as local artists, to attend lectures to help improve their techniques and to gain experience to exhibit their works. The goal of the programme is to foster artists to the next level of creativity, at a global level. Following a lecture series at N3 Art Lab, Yamaguchi, with talks from: Professor Isao Suizu (Aichi Prefecture University of Fine Arts and Music); Katsuhito Nishikawa (an international Japanese artist, living in Germany); Osamu Ikeda (representative of BankART1923 in Yokohama); and Jumaadi (a contemporary artist originally from Indonesia currently living in Sydney), a conclusive exhibition was then held at 4 locations in Japan which allowed emerging artists to participate. Alongside the artists’ exhibited works – resources and videos from the publication were also displayed – Neil was invited to contribute a text for the publication. Neil wrote about his admiration for the Sesshu garden in Yamaguchi he visited in 1999. We are delighted to be named 'Architect of the Year' and receive the prestigious Schueco Gold Award at the annual BD Architect of the Year Awards. 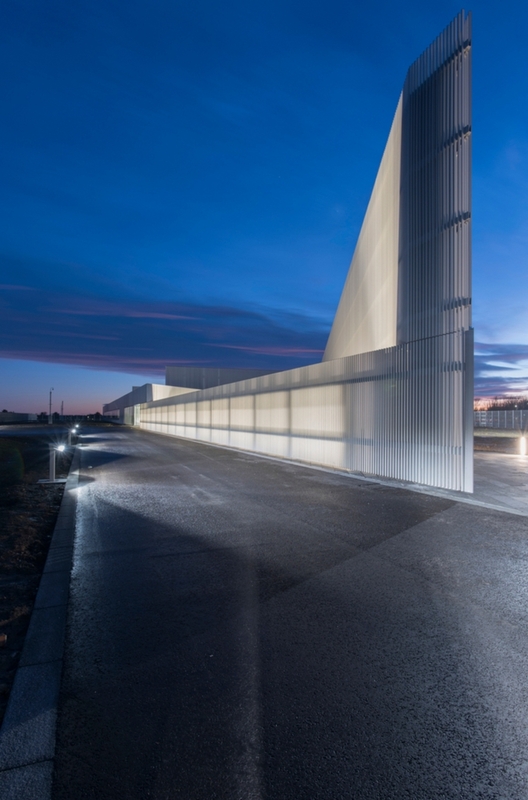 The Schuco Gold Award is presented annually to the practice that the BD AYA judges deem to have made the most significant contribution to British architecture over the past year. The judges noted that our work showed both "creativity and flexibility" and recognised that we have made the Stirling Prize shortlist for two years in a row. We would like to thank the BD and our clients for their continued support and congratulate our whole team for their combined effort and talent, recognised by this award. 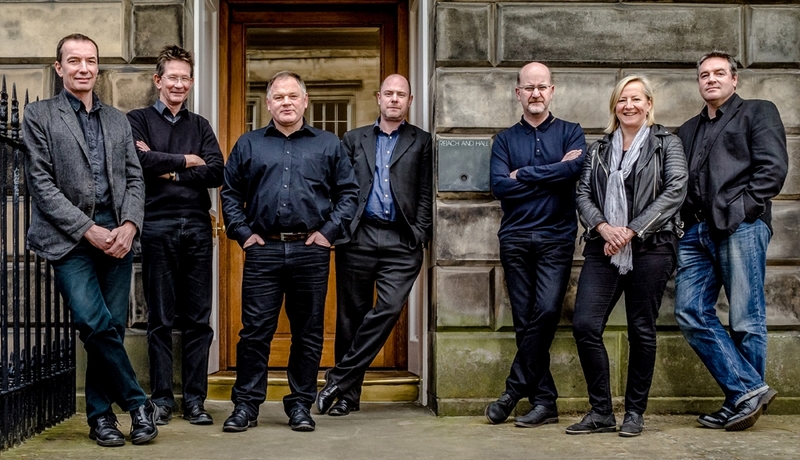 Reiach and Hall has made the BD Magazine’s eight-strong shortlist for Education Architect of the Year [Higher Education]. As part of the award submission Reiach and Hall demonstrated a portfolio of work with around 50 education sector examples. These include built projects, projects on site and projects still at design stage. This is a very active part of our portfolio and we continue to be excited with the changing needs of education and the design ideas associated with learning. As the award process moves onto the next stage, the judges will now be looking for evidence of all-round design excellence and fitness for purpose through the overall body of work presented. 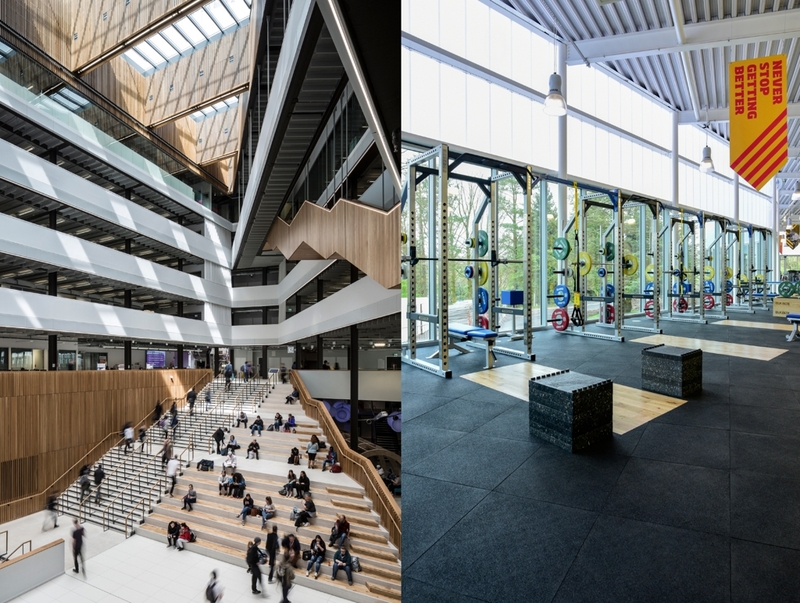 The winter edition of Urban Realm magazine featured a building study on our newly completed Oriam building for Sportscotland, Heriot Watt University and the City of Edinburgh Council. The building, complete in August 2016, is Scotland’s Sports Performance Centre, based at Heriot Watt University. It is the home for Scotland’s future Olympians, Six Nations Champions and World Cup footballers as well as supporting local, national and community sport. Our Riverside Campus, for the City of Glasgow College, has been shortlisted in the 2017 Civic Trust Awards. "is a project that explicitly celebrates Glasgow’s relationship with its engineering and maritime past; a civic scaled group of buildings appropriate to its riverside location and to the scope of the learning opportunities it provides for the Faculty of Nautical Studies and Faculty of Building, Engineering and Energy…. Whilst the campus occupies a site by a busy crossing to the south of the River Clyde the composition of the 3 buildings … engages not only with the river but with the wider city – creating a memorable addition to the skyline"
We now have the chance to receive a Civic Trust Award or commendation, with winning schemes to be announced at the 58th annual Civic Trust Awards ceremony in Winchester on Friday 10th March 2017. 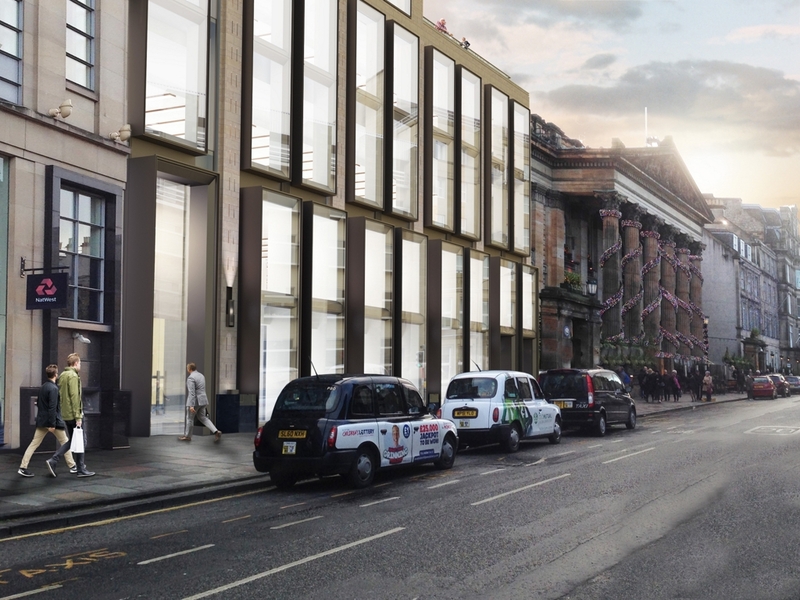 Reiach and Hall have submitted planning for the refurbishment of 10 George Street, Edinburgh – with the ambition to provide high quality office accommodation for a leading investment management company. 10 George Street was designed by the practice in the late 1980s and secured an RIBA Award in 1992. We are delighted to be invited to revisit it. The proposals will rebrand and renew the building, extending its useful life and bringing it up to the best in contemporary office standards. Proposals include the replacement of the existing curtain walling and a new extension to the upper floor, affording superb rooftop views over Edinburgh’s Georgian New Town. Minor adjustments are being made to the existing floor plates together with a general improvement of the arrival experience for visitors and staff, with a new double height entrance and reception. Reiach and Hall are working with Buro Happold and Cushman & Wakefield on the proposals.